June 2018 - "Creating a home office for the perfect working environment"
In recent years, a growing number of men and women in the UK have switched to home working, whether on a permanent basis or just for the occasional day. Given the connectivity we now have thanks to the worldwide web and the environmental benefits of having fewer people commuting to a central office, it would appear that home working is here to stay. The problem for some is that balancing a laptop on the edge of the sofa and trying to concentrate on work in the process is somewhat difficult, but there are plenty of people who have converted a room or at least a section of a large room into a viable, working home office. If you thought this would be a difficult process, it might be time to think again. One of the most important issues facing any such conversion is the provision of electrical outlets. In many older homes, there are simply not enough plug points to cope with the amount of appliances we need to use, but when a room is turned into an office the need for outlets becomes even more crucial. This is something that a Crawley electrician can help you with. So much power but not enough outlets? In any home office, there is likely to be a desktop or laptop computer (or perhaps both), a monitor, printer, table lamp and a whole host of other items such as phone chargers, sound bars, audio speakers, heaters and fans. In truth, older properties are struggling to cope with our need for electrical equipment, so converting an office has to take into account the number of outlets that will be needed. Another major issue, and it’s one that’s often overlooked, in interior lighting. If you work in a traditional central office, you will no doubt have tailor-made lighting already in place, but this obviously isn’t going to be the case in a domestic environment which was perhaps designed as a small child’s bedroom. Because of this, expert advice from an electrician in Crawley could prove crucial. Here at Goodman Electrical, we can help you to create an office that ticks all the right boxes. We can provide adjustable lighting solutions, for example, which easily switch from subtle and understated to bright and powerful as and when necessary. And if you’re looking to be surrounded by music while you work, have a chat with us today about speakers. Goodman Electrical are based in West Sussex, and we offer a comprehensive range of electrical services for both domestic and commercial customers. Call us today on 01342 714 334 to discuss any projects you might have in mind. May 2018 - "The many benefits of switching to LED lighting"
More and more people are turning their backs on the traditional light bulb and embracing LED options instead, and there are several good reasons for this. Here at Goodman Electrical, we supply and install LED fittings for homes and business premises, and we are always happy to advise customers on the options that are available to them. Here are four reasons to say yes to this impressive new development. Of all the good reasons to go down the LED route, the benefit to the environment is perhaps the most important. Typical LED bulbs can use up to 90% less energy these days, and further improvements to their energy efficiency are always being introduced. In simple terms, LEDs convert electricity far more efficiently, and the end result is less of a drain on our resources. When LED lighting was first introduced, there were understandable concerns about the longevity of the bulbs. This has become a thing of the past in no time, thanks to the way they are able to easily outlast conventional bulbs. Most LED bulbs are capable of lasting upwards of 50,000 hours, a time period that the majority of older bulbs were unable to even get close to. Modern LED bulbs are as bright as any that we’ve used in the past, and they can provide a less harsh light than traditional bulbs. When looking to replace your old bulbs, you need to convert the wattage we once looked for into lumens instead. For example, an old 100-watt bulb can be replaced by an LED that offers 1,600 lumens. As always, our Crawley electrician will be able to advise. The older, traditional form of light bulb was notoriously fragile, a fact which resulted in many breakages of both the glass and the filament. LEDs are designed to emit less heat, so there is less chance of damaging the glass. They don’t contain mercury or lead, and generally once an LED bulb comes to the end of its life it’s far simpler to change it without causing harm to the unit or to the user. Here at Goodman Electrical, we know all about the plus points offered by LED lighting, and we’re always happy to speak to our domestic and commercial customers about making the switch. Have a chat with our electrician in Crawley today. April 2018 - "Making homes and businesses safer with rewiring projects"
Just about everything deteriorates over a period of time, and your home is no different. Brickwork, plasterwork, floor coverings and door and window frames will all be in need of attention at some point, so keeping a close eye on the condition of your house or flat is of paramount importance. The same principles apply to the home’s wiring, of course. On average, a partial or complete rewire becomes necessary every 25-30 years, and there are several good reasons to make sure your wiring is of the highest standard and is functioning to the best of its ability. It goes without saying perhaps that safety is the most important criteria of all. A poor, outdated wiring system can prove to be a serious fire risk, so if you’re in any doubt about your current system it would be a good idea to consult a Crawley electrician at the earliest opportunity. Erring on the side of caution is the key. There are visible clues which can give you a general idea of the quality of your home’s wiring, although only an expert could declare for sure that your system is completely safe. 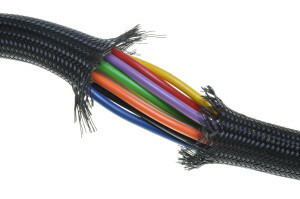 Older properties with cabling that’s insulated with lead, fabric or rubber are likely to need a complete rewire in the soonest possible timeframe. And while modern PVCu coated wiring is usually deemed the safest it can still get damaged and start to deteriorate. It’s also worth noting that our homes generally contain more electrical appliances that they did in the past, and your current system may not be able to cope with the extra workload. A full rewire on a house will usually take several days, and the disruption to the home can be substantial while the work is carried out. The end result, however, is worth the effort. Your home will be safe, will have new wiring designed to cope with a heavier workload and a new consumer unit that’s designed for 21st century working. If you have any doubts about the safety and efficiency of your current system, have a chat with an electrician in Crawley today. Here at Goodman Electrical, we’ve been carrying out rewires for many years using the latest materials and providing fully insured work for both domestic and commercial customers. Goodman Electrical provide top quality rewiring projects for homes and business throughout Sussex and Surrey. If you’re keen to discuss a rewire for your property speak to a Crawley electrician on 01342 714 334 today. March 2018 - "Enhance your garden with stylish outdoor lighting"
In the warmer months, nothing beats spending time in the garden with family and friends. Intimate al fresco meals, elegant family suppers and feeding the masses via an afternoon barbecue can be extremely enjoyable occasions, and they can become even more special when you enhance the garden with innovative lighting. There’s a diverse selection of lighting options on the market these days, and they don’t have to cost an arm and a leg to install or to run. Have a chat today with an electrician in Crawley about ways to enhance your outdoor living area, and you may be pleasantly surprised by what you can achieve. These days, the running costs for most options are relatively low, so you can afford to be creative right from the start. The lighting options you choose will depend on the space you have available and the mood you are trying to create, so it makes sense to think about such a project in advance before going ahead with it. 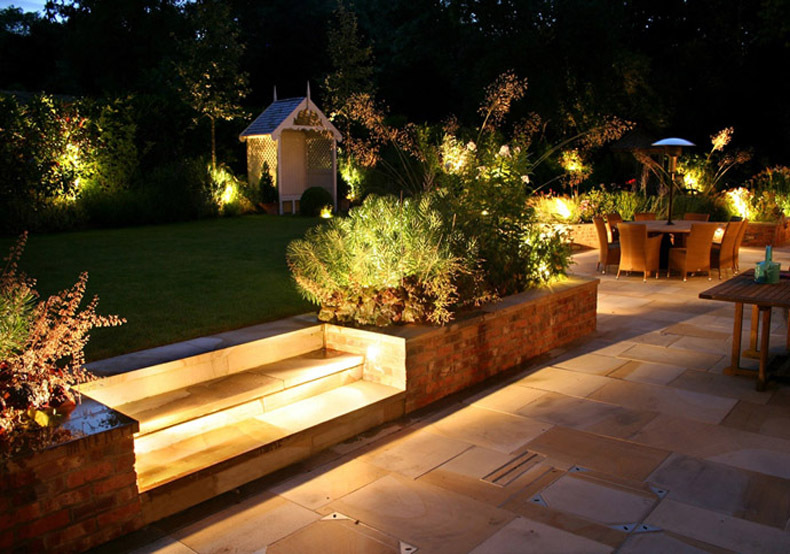 If you’re fortunate enough to have a large garden, you can define individual areas with intimate lighting. Areas such as the barbecue itself, a pergola or gazebo and the dining table can be illuminated separately, adding to the sense of space and creating a specific mood for each section. In smaller gardens, soft lighting will add to the cosy feel. Festoon lights offer a warm glow during even the darkest nights, and will create a welcoming atmosphere to all. It might be worth thinking about ground-based lighting to illuminate a path, or even sunken lights in certain locations to give an overall warmth. Uplighting trees and bushes can create an eye-catching effect at night, especially when you’re entertaining. In the winter months, when you’re not likely to be using the garden after dark, lighting can still be used to add warmth to the view, and in effect to extend the indoor living area to the outside. To find out more, talk to a Crawley electrician today. Goodman Electrical specialise in electrical services for both domestic and commercial properties. Contact us today on 01342 714 334 for more information. We look forward to hearing from you.